The 66-year-old driver who suffered cardiac arrest and crashed into a concrete marker outside Folsom Hall in December 2017 may not know that two Sacramento State Police officers saved her life. However, their heroic efforts were recognized by the California State University (CSU). Corporal Scott Christian and Officer Matthew Light were among seven officers from CSU campuses to be honored Jan. 23 during a reception at the Chancellor’s Office in Long Beach. Chancellor Timothy P. White presented Christian and Light with lifesaving commendations. “The CSU is remarkably fortunate to have compassionate and courageous men and women serving in peacekeeping roles across all our campuses,” White said. 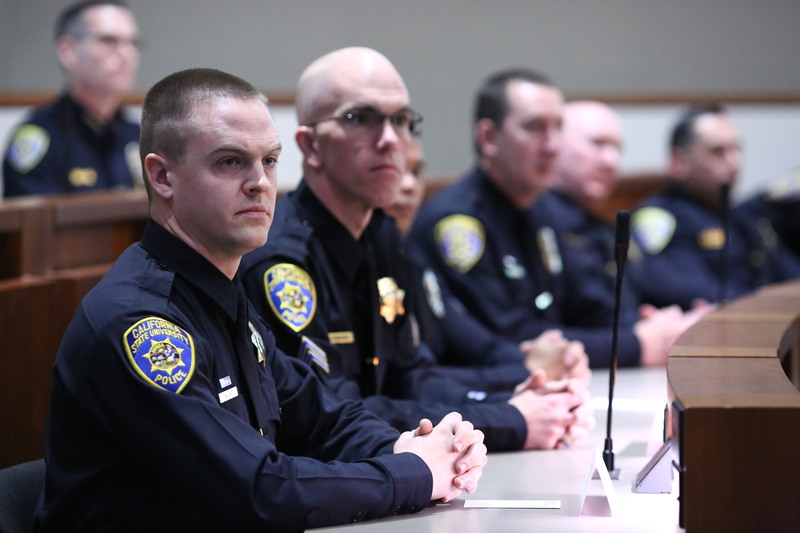 On Dec. 6, 2017, Christian and Light were sitting down to lunch at Sac State Police Department headquarters when they were dispatched to nearby Folsom Hall, home of the University’s Center for Health Practice, Policy, and Research. Two of their Sac State Police colleagues – Community Service Specialists Israel Vargas and Jose “Humphrey” Meseguer – had stepped out of Folsom Hall to begin their perimeter patrol when they saw a white Hyundai Santa Fe leave the road, plow over a fire hydrant and crash into Folsom Hall’s concrete address marker. They immediately radioed Sac State Police dispatch, rushed to the vehicle, and reported that the driver was unconscious and not breathing. Meanwhile, Christian and Light were speeding toward Folsom Hall, lights flashing and siren blaring. They gently pulled her from the vehicle, opened her airway, and checked for a pulse. She had none, so they applied a breathing mask and performed two-person CPR until paramedics arrived. The next day, Christian called the hospital to check on the woman. “Her doctor told me that Matt and I had saved her life,” he said. Happily, she would be home with her family by Christmas. “The outcome was what we hope for every time something like this occurs," said Sac State Police Sgt. Jeff Reinl. "While incidents of this nature don’t occur every day at Sac State, the professionalism, dedication, and care for the campus community and visitors that Corporal Christian and Officer Light displayed on that day are a regular practice. I couldn’t be prouder of them." Both of the honored officers were #MadeAtSacState. Christian, the first in his family to finish college, graduated in 2000 with a bachelor’s degree in Humanities & Religious Studies. He joined Sac State PD in 2004, after serving in the Marine Corps. Light, who was named the Sac State Police Department's 2018 Employee of the Year, graduated in 2007 with a bachelor’s degree in Criminal Justice.